I had a good sleep after our journey home from Slovakia. I lie down and I sleep and I wake again sustained by The Lord. These are days to rest after Brendan and my work in Eastern Slovakia. We met beautiful families there. It is a privilege to have the opportunity to share with others God’s goodness and mercy. I went out to the greenhouse to fetch a tomato for my breakfast. Brendan was creating a treat for me on our first morning home. One particular tomato plant has been blossoming and bearing fruit long after the others have withered. I bought three different varieties of plants at the beginning of spring. The tomato plants all looked alike on the shelf at Homebase. Gardener’s Delight is the only one still bearing fruit. Take note anyone with a greenhouse and green fingers out there. You shall bear fruit in old age. Your leaf will not wither. I gathered some fruit. Brendan called me for breakfast. It was very welcome. My strength will be renewed after a few more days of rest. Later today my son was telling me about a lady he met recently. She was a young at heart seventy eight year old. She works in a Charity shop three days a week and travels from Carryduff with her bus pass. This lady welcomed customers warmly and engaged each in conversation. John was struck by her enthusiasm. He listened to some of her life experiences. She worked in the company C & A in Belfast. She turned in for work looking the part, well suited and make up, perfect. She spent her money on the latest fashion and good food. After marriage she decided to give up work and rear her children. She found that she was able to manage without the extra income her job could have offered. She survived without the latest fashion and the best of food. She learned to budget and enjoy being home with the children. When her children were reared she went back to education and got qualifications to teach, which she did till she retired. On retirement she launched into some other activity. This lady has important life experiences and is sharing them with anyone who will listen. She is not giving up. She is living life to the full. Her leaf is not withering and she is bearing fruit at old age. I return to Northern Ireland. I carry the benefits of the holiday in Greece on my skin, in my mind, and in my body. I have my beauty treatment for the winter and the few extra pounds will sustain me in the colder days ahead. My mind and body are rested. Our son Isaac welcomed us with a meal of cooked fish. He had fished it from the sea just an hour earlier. He had caught it when I rang to let him know we had landed into Belfast and were on our way home. I am reminded of the story in the bible about Jesus preparing a meal of fish for his disciples. “As soon as they were come to land, they saw a fire of coals there, and fish laid there on,and bread.” KJV John 21 v 9. Back in Ireland, warmth and freshness are in the air. Flowers in the garden are flourishing in the extra September sunshine. 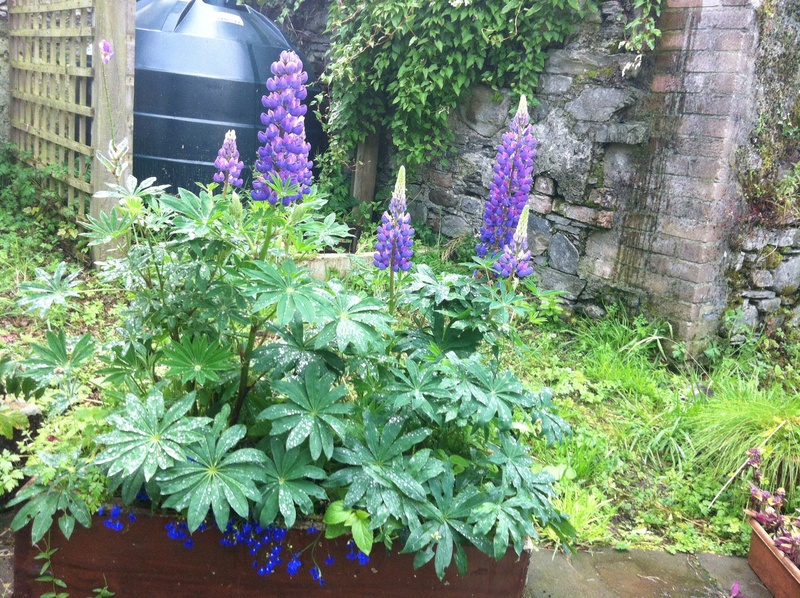 Purple Lupins give a welcome display at my back door. A light shower of rain fell. The beads of water glisten like diamonds. 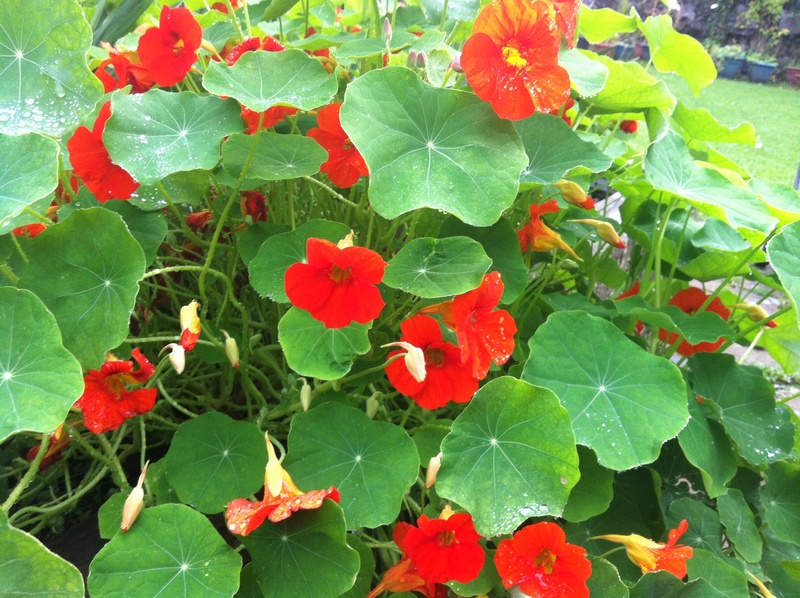 Nasturtium planted late must think it is spring. I love the deep green of the leaves and the orange, brown flowers. I spent a while in the green house. Tomato plants that didn’t need must attention all summer, have become fruitful vines. I pruned back leaves to expose the fruit to the sun. The main stem can now send its energy to the ripening fruit. Apples in the orchard are being painted red with the evening September sun. The fruit that has fallen to the ground has been chewed on by rabbits and pecked at by birds. What a picture of God’s beauty and goodness. The leaves in this picture glow like a fire! 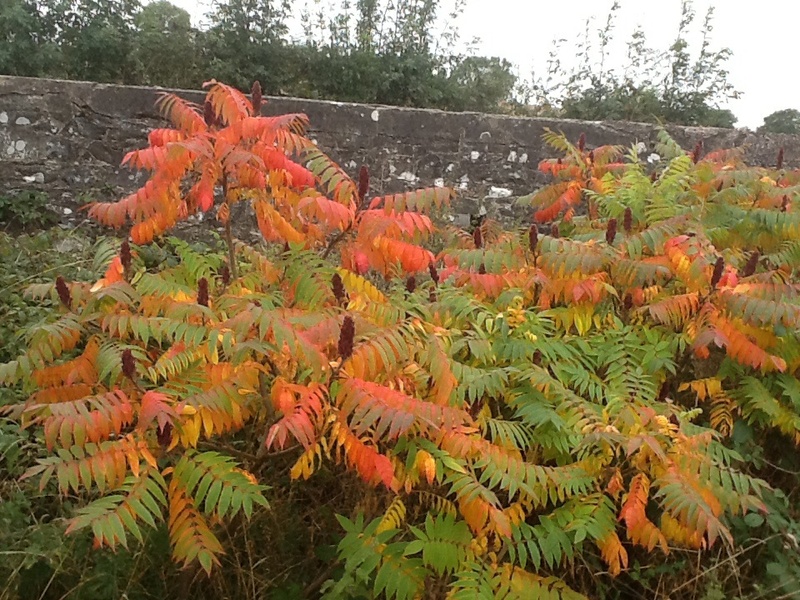 This plant gives a great display in the autumn. It never fails. I discovered this tree growing beside a little stream that flowed under the bridge. The photograph was taken between Banbridge and Rathfriland in Co Down. You can see the wall of the bridge behind. The tree was flourishing in the shade of the wall and in a sunny aspect with it’s roots bathed in damp soil from the stream. Jeremiah 17 v 8 says “Blessed are those who trust in The Lord. They are like trees planted along a riverbank, with roots that reach deep into the water. This picture reminds me of Revelation 22. As I grow beside the river of the Holy Spirit, soaking up the life from Him, I produce fruit and leaves of healing that I want to share with others. And now, just as you accepted Christ Jesus as your Lord, you must continue to follow him. Let your roots grow down into him and draw up nourishment from him, and let your lives be built on him. Then your faith will grow strong and vigorous in the truth you were taught, and you will overflow with thankfulness for all he has done. (‭Colossians‬ ‭2‬:‭6-7‬ NLT). The tree above is a picture of faith. The stream beside the tree can represent The Word of God. As I read it, I grow and I get nourishment. My faith will grow. My fruit and leaves will bring comfort and healing. Get deep into God’s word and others will come and see you burn with fire and they will get touched by the heat. It is the blackberry season. My granddaughter Rebecca is nine today. Her family came up at the weekend. 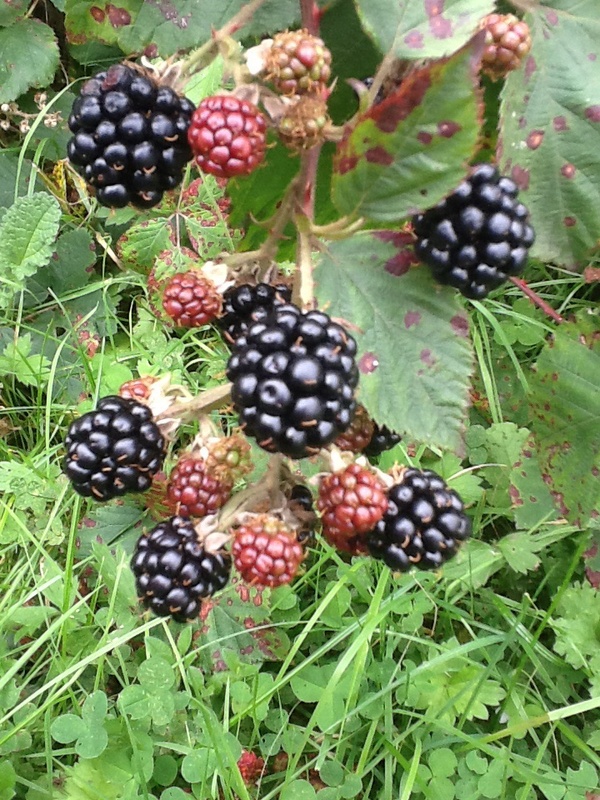 Rebecca noticed blackberries along the hedgerows as they drove along the Irish country road near our home. She wanted to go blackberry picking. Jacob my son is enjoying living in the country. He offered to take Rebecca and her two sisters out to play while we talked with their mum and dad. I remember when my sisters and I went blackberry picking. The local store collected the fruit and we earned a certain amount for each pound. We valued the extra money. It was an incentive to go out along the hedgerows looking for the black berries. We competed with each other to see who would have their jar filled first. When we filled a small jar we would empty it into a bigger container. Our fingers were covered in the black juice, as were our lips. Last week we visited a friend who offered us fresh blackberry sauce and custard. It was delicious. So Rebecca’s mum will be making some blackberry conserve. The family will remember their visit to grandma’s house.